Having been to Kerkini before, I knew what to expect and could prepare for specific kind of images. 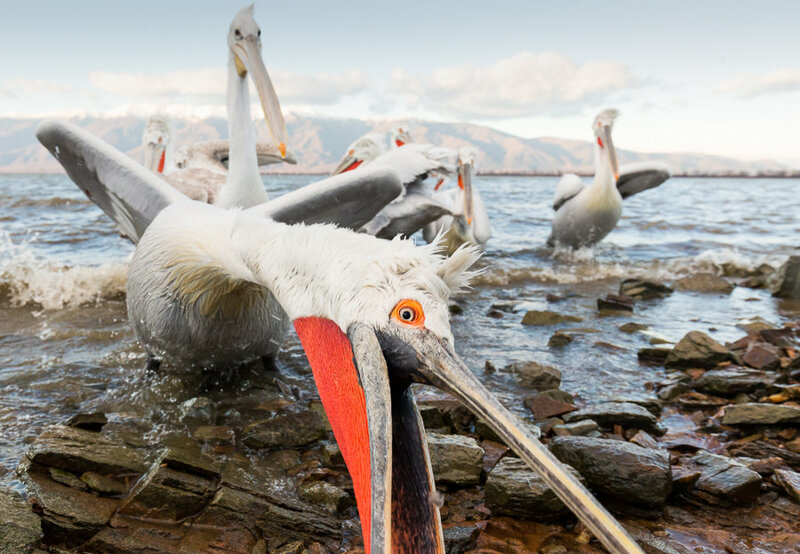 High on my agenda was to go for low-key images of these magnificent birds inspired by the UK based wildlife photographer Richard Peters who led the Kerkini workshop in 2016. On Sunday 14th January 2018 we had a morning flight from Copenhagen to Athens followed by a 600 km drive to Kerkini. We arrived at Hotel Oikoperiigitis late in the evening and had the Monday at our own. The weather was dull and grey with the occasional sleet. Therefore, we spend most of the time in the car covering the lake in a clockwise direction. 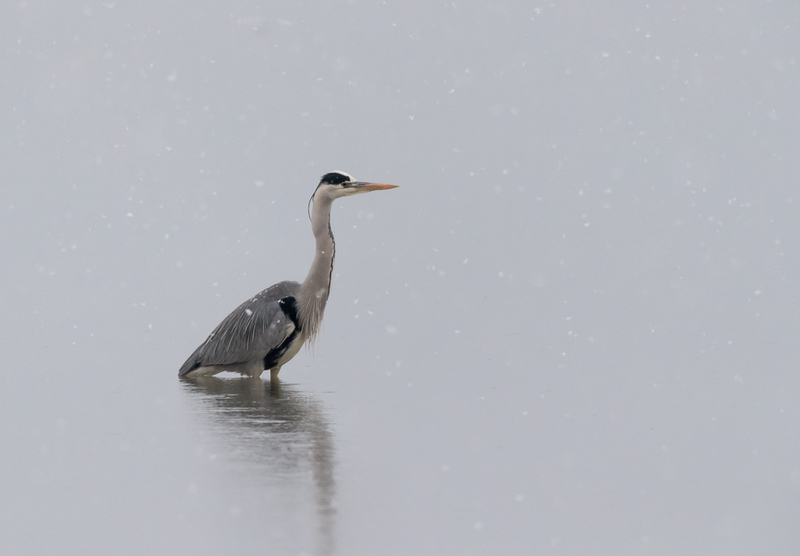 Once, I braved the weather and went out to photograph a grey heron standing in the lake at close range. In the evening we joined the other participants for dinner and had an introduction to the days ahead by our tour guide Sean Weekly and Vasilis who is the boatman and local anchor at the hotel. We left the hotel a quarter to seven in the morning for a short drive to the harbour of Kerkini. 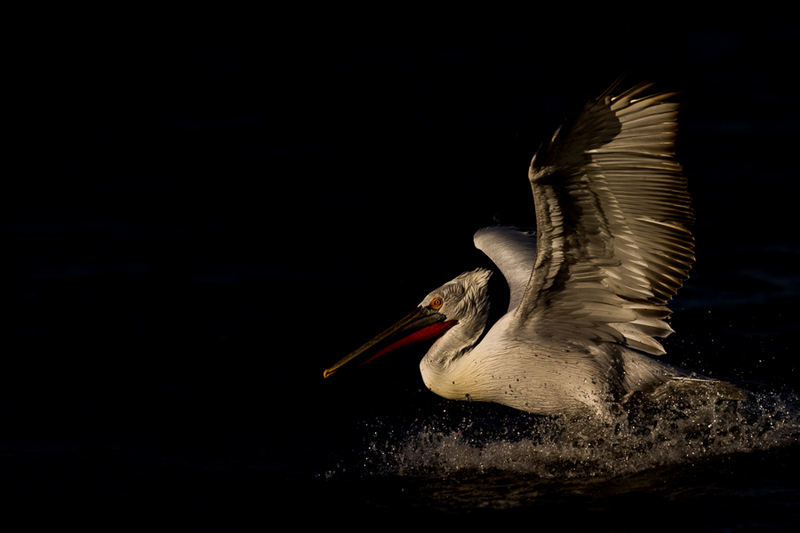 It was still dark as we entered the fine wooden boat with two buckets of fish to attract the pelicans. 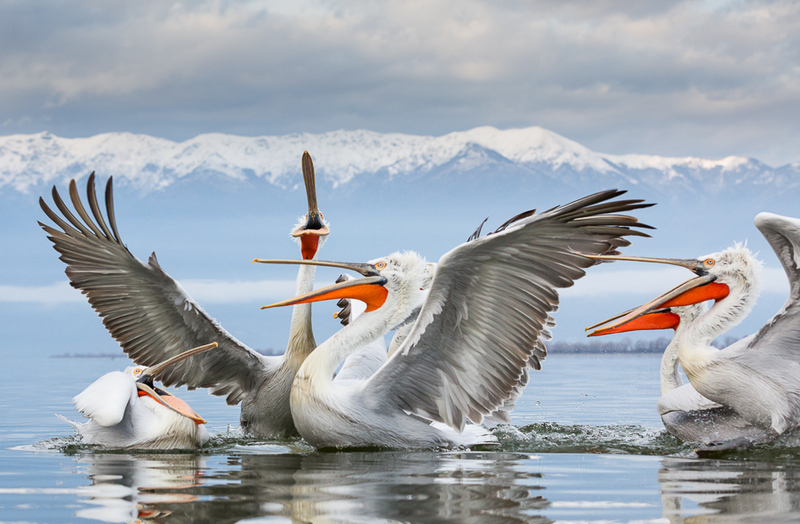 Soon after leaving the harbour, the first Dalmatian pelicans joined us and had some fish to let them stay by the boat until we could start taking pictures. 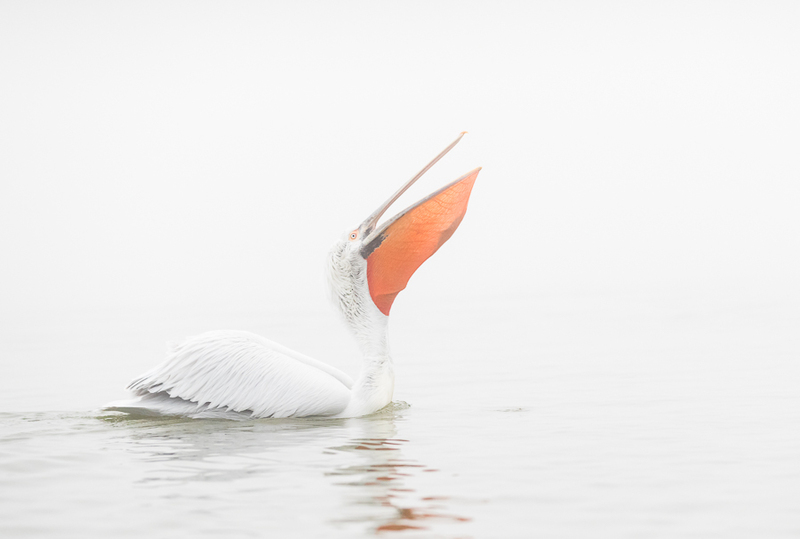 It was a bit cloudy but when the light was sufficient for the cameras, Vasilis would sail the boat at high speed and throw out fish allowing us to get images of flying pelicans. 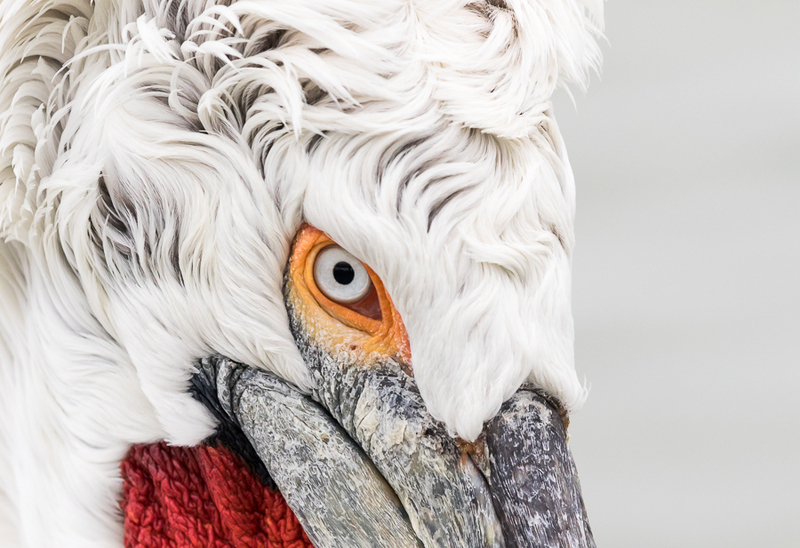 Amazing to have the world's largest freshwater bird at such a close range. 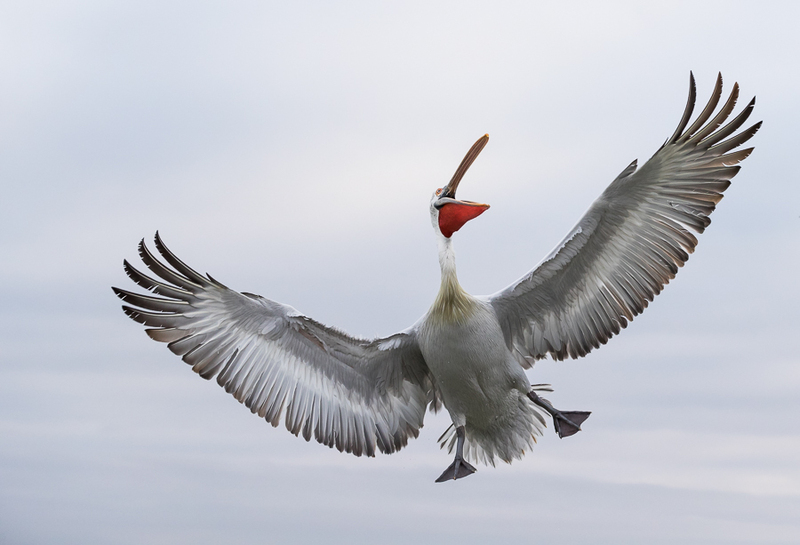 Dalmatian pelican high in the air - the wingspan is more than 3 metres! 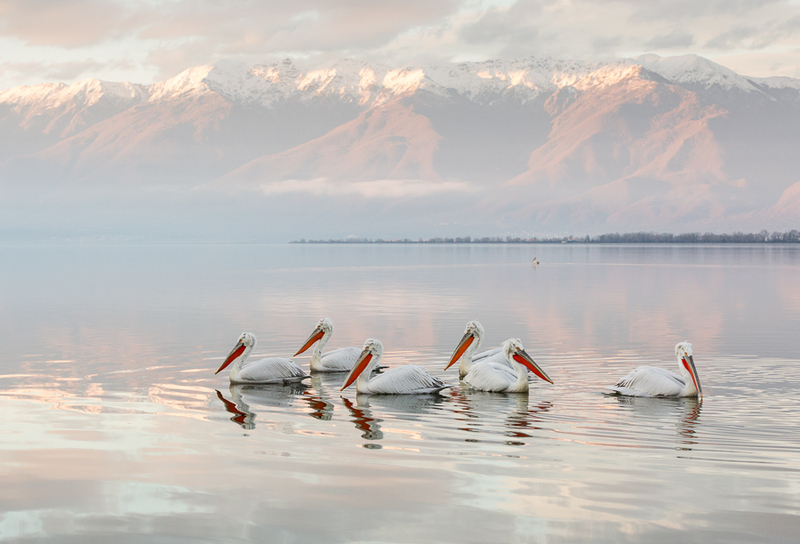 Occasionally, the pelicans - and Vasilis - needed a rest and we turned off the engine. 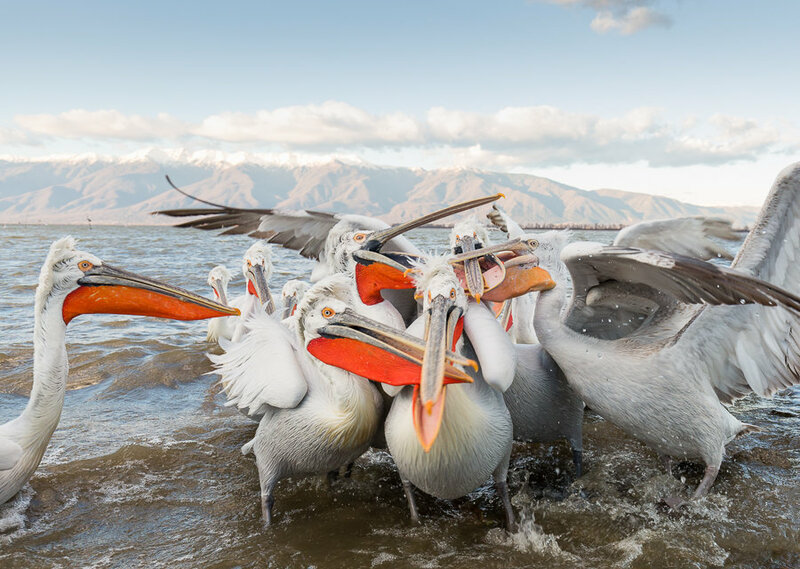 Then, we could go for close ups and wide-angle images of the pelicans floating nearby the boat waiting for more fish. 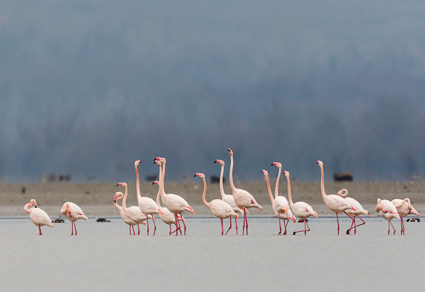 At one time, we passed a lot of flamingos standing in shallow water. They were at a long distance and we could not get any closer due to the low water level. Fortunately, I had my long lens and a 2.0 teleconverter and managed to take a few useful images. 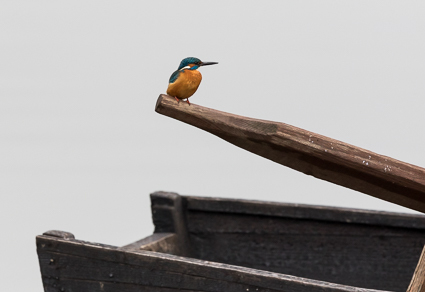 Back at the harbour, a beautiful kingfisher sat on one of the rowing boats and I succeeded in taking an image of the colorful little bird. Following lunch, we headed south by car to the dam for a shoreline feed. The weather had improved and even the sun was out. 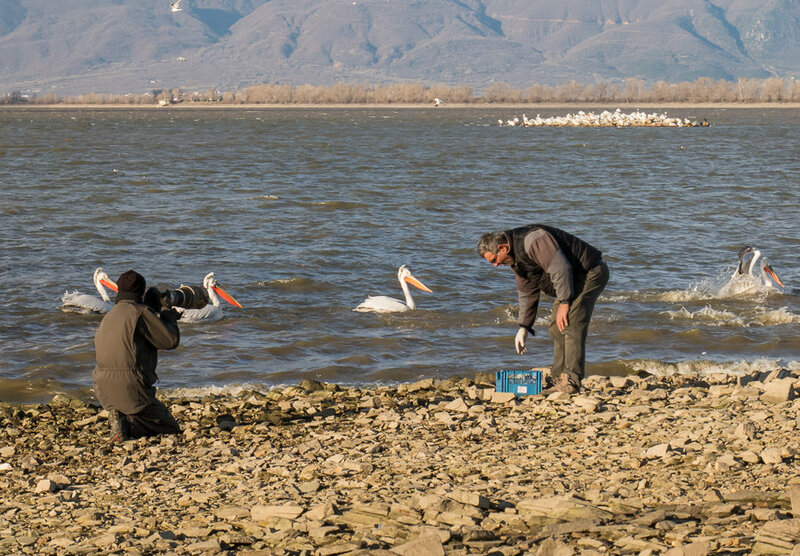 Vasilis made an attempt to attract the pelicans with his fish and 10-12 birds arrived from a little island nearby. By sunset the soft light was beautiful and eight happy photographers returned to the hotel for dinner and storytelling. The fog was thick when we returned to the boat next morning. We hoped for the sun to take over - it did not! After two hours just outside the harbour, we decided to go back to the hotel and wait for brighter weather. We had an early lunch and returned to the boat spending the afternoon on the lake. The fog had cleared but it was a grey day. This time, we sailed south to the dam and passed the small island where pelicans and cormorants hang out. Despite the weather conditions, we had a nice afternoon and even got some useful images. It had stormed heavily all night and it was uncertain if we could go out on the lake in the morning. Vasilis had been to the harbour for inspections and decided for us to go. Still, the wind was strong and we had to stay close by the shore. 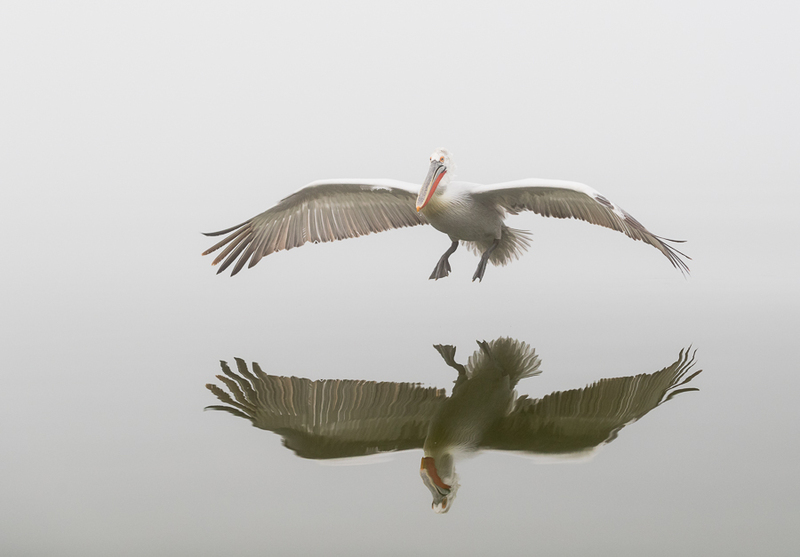 Only a few pelicans were in the area and due to the weather, we could not go further out on the lake to find more. However, we did get some interesting images and the sun was out. It was troublesome to photograph and suddenly the wind was building up again. We even saw the water raise due to small tornados - it was time to head back! Back at the hotel the power had gone as the gale had brought down some trees on the wires and cut all electricity in the area. Fortunately, the hotel had a generator up running within a few hours. After lunch, we once again went to the shoreline at the southern part of the lake for a last photo session. 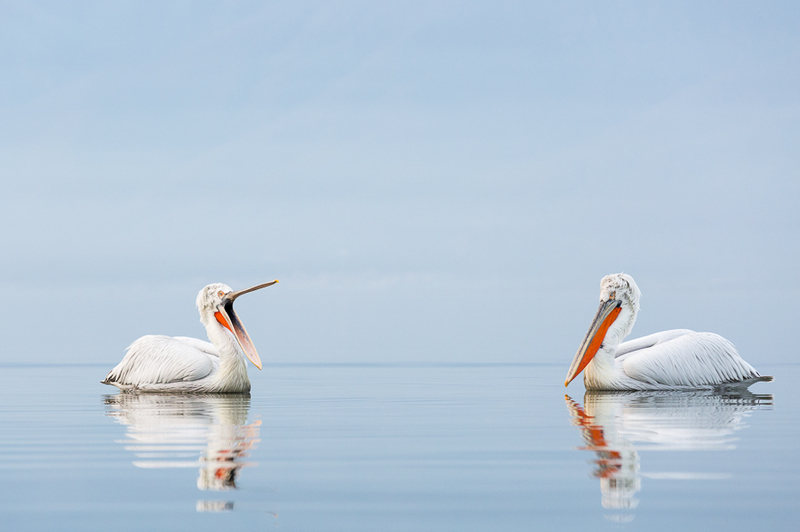 Despite a huge bucket of fish, we could not attract any pelicans to the shoreline. 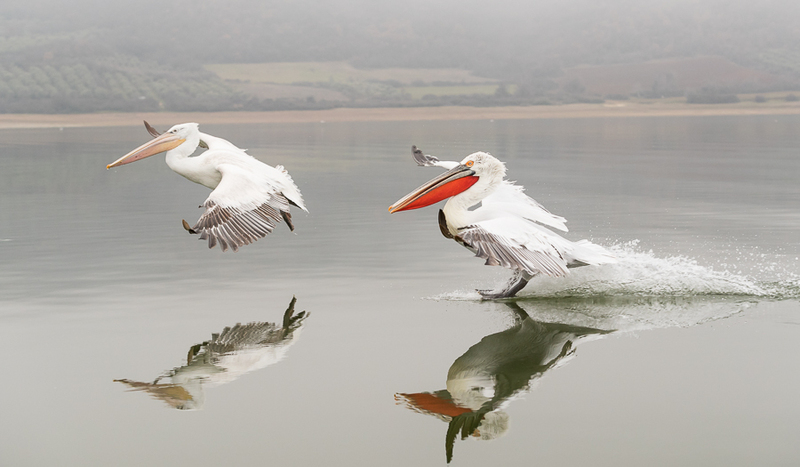 The waves were too high so the pelicans did not dare to land. 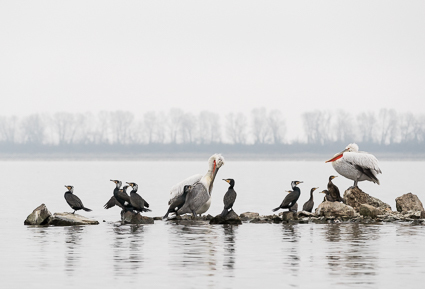 Then, we went further north to another place close by the small island where the pelicans stayed. 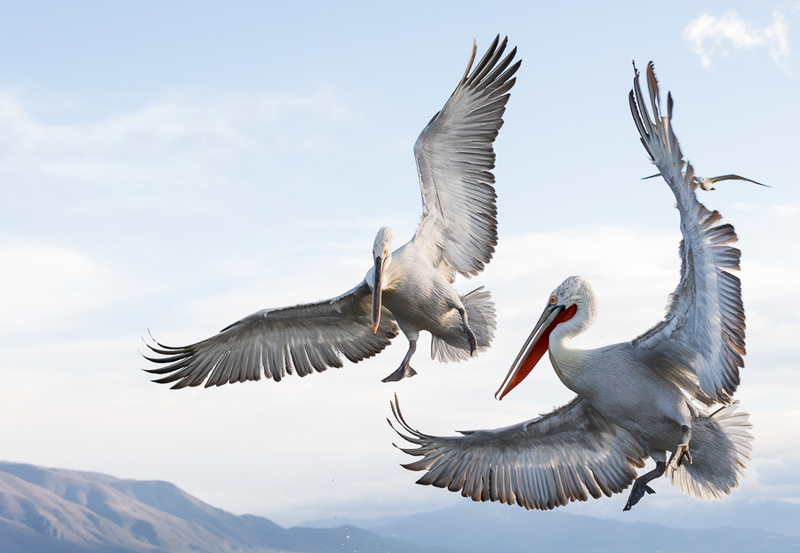 Now, some hungry pelicans joined us and were rewarded by a nice meal. Apart from the strong wind the weather was fine with sun and blue skies. Finally, I had the opportunity to get some low-key images as planned before the trip. 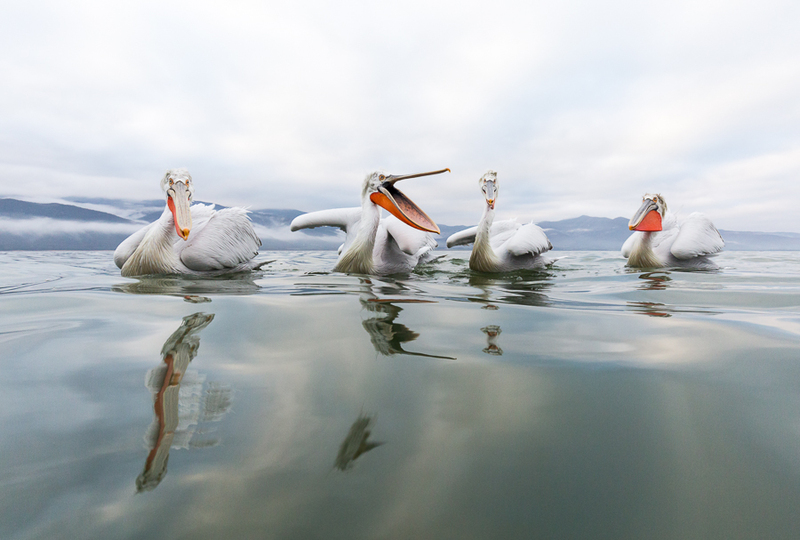 We completed the afternoon with some wide-angle shots where the pelicans are getting very close. 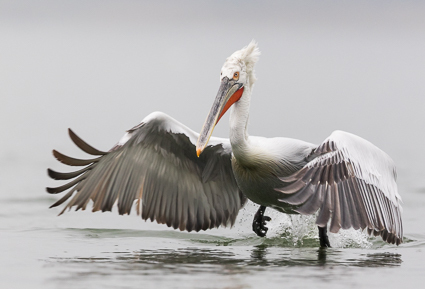 The last fish was put just beside me on the shore and then snatched by a pelican right in front of the camera. Back at the hotel we enjoyed a farewell dinner before packing for the return travel next morning. Despite the challenging weather conditions during the three-day workshop it turned out to be a great trip with a lot of new fine images to my portfolio. 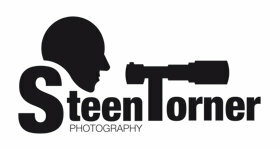 Not least due to our guide Sean Weekly who is a very supportive and skilled young photographer with a huge engagement and enthusiasm. I hope to be able to join Sean for another workshop in the future. 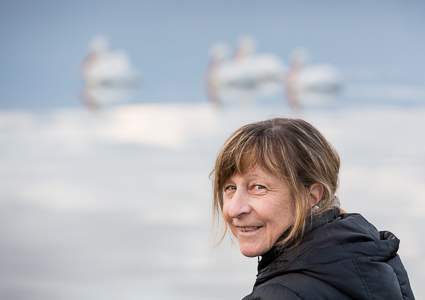 Besides the photogenic Dalmatian pelicans, I also loved coming back to the wonderful Vasilis who is the boatman and much more. Never have I come across a friendlier and caring person. Vasilis will do almost anything to make your stay a success - wonder if he ever sleeps? 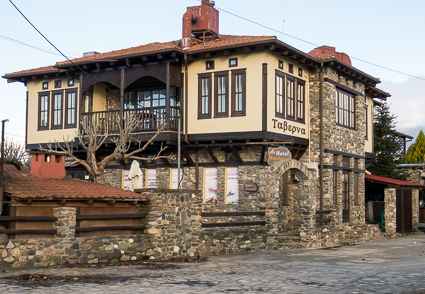 It was time to leave Kerkini and Hotel Oikoperiigitis - I may return once again!